My first year of teaching was terrible. I will always remember a moment where I watched my students in disbelief as if it was an out-of-body experience. Paper balls flew back and forth and one particularly defiant child stood on top of his desk to do his best Michael Jackson impression. I had big dreams of leading a democratic classroom, where students’ voices were valued. Instead, I was presiding over total anarchy. Like most new teachers, my second year was a complete turnaround. I found my “teacher voice” and found a way to maintain a safe and orderly classroom environment. My classroom management has continued to grow stronger since and has enabled me to deal with some pretty challenging behaviors. But, in my seventh year, I’m striving to relinquish some control to build a different kind of classroom. At this point, safety and calm are easy enough. What I really want to create now is a classroom where I’m as accountable to my students as they are to me. I want a classroom where my students feel full ownership of their learning. I want a classroom similar to the one I envisioned when I first started teaching. This requires me to rethink my role less as a classroom manager and more as a community builder. 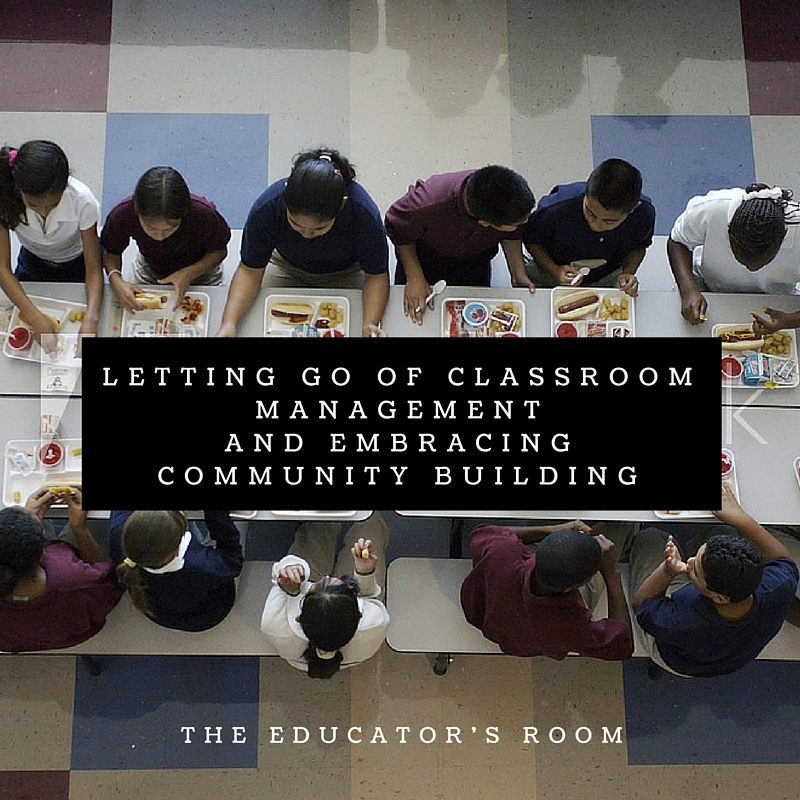 What’s the difference between classroom management and community building? Although it’s not always intended or explicitly said, classroom management is often conflated with control. It starts with a simple, positive concept: Keep kids safe and make sure they’re learning. But in many classrooms classroom management becomes keeping kids quiet, keeping kids in their seats and generally just keeping kids compliant. Nothing illustrated this idea more clearly or disturbingly than the recent Spring Valley High School assault and a response I heard from many educators: The officer’s behavior was excessive, but the student should have followed directions and respected the teacher. The logic underlying this refrain is that the student must have complied with the teacher’s directive and classrooms, in general, should be places where teacher authority is sacrosanct and inviolable. But this unspoken definition of classroom management contradicts the educational philosophy so many of us claim: that we want to create critical thinkers and active citizens. That’s why I’m striving to leave “classroom management” behind in favor of community building. For me, community building better speaks to the higher aspirations of classroom management: the creation of a safe space where all voices are respected and everyone is working in pursuit of a common goal. For the past three years, I have used the Responsive Classroom approach towards this goal. It is by no means the only way, and many of the techniques and routines in Responsive Classroom can be found in other places under similar names. In my classroom, one-way community building takes shape is through daily morning meetings and closing circles. These are opportunities to open and close our day by coming together intentionally. During the morning meeting, each child is greeted and there is an opportunity for several kids to share their ideas and answer questions from their peers. When time permits I end with a “team builder”, some sort of simple game that requires cooperation among the students. During closing circle, I ask for three students to “shout out” a classmate and three others to share something they learned. This is a routine I “stole” from my time working for an organization called Citizen Schools. I have seen that by greeting one another and sharing ideas, by celebrating one another’s successes and reflecting on our learning, we are more than just a teacher and 20 students, we are a community. This modeling, of course, needs to be balanced with the need to be culturally responsive. So in other situations, I may opt for brevity and directness. But by sprinkling in “I statements,” I hope to show students the kind of respect that I want in return. Beyond teaching and practicing certain communication, I also try to build community through read alouds that focus on themes of fairness, through choosing a class motto and also a class “team name”. Thematic read alouds and class mottos aren’t unique to my classroom, but as I have focused on community building I have found that these rituals have been central. Meanwhile, they might be tangential to the work of classroom management which in practice often focuses on procedures, incentives, and consequences. Both classroom management and community building share a goal of creating a positive classroom culture. As educators, we all want our students to feel emotionally and physically safe. Where classroom management differs from community building is that it can be done without mutual respect. It is possible to maintain order without demonstrating vulnerability or compassion. A community, on the other hand, is built on mutual respect and strong caring relationships. That’s the kind of space I want to spend my days teaching in.